It isn’t 2021 and therefore Formula One’s rules for louder and cheaper engines aren’t in effect yet (because F1 is silly and announces new rules four years in advance), but the engines are still decently loud up close. Here’s what the series-dominating Ferrari and Mercedes F1 engines will sound like this year. Those videos probably left me feeling somewhat excited for the season, but also robbed that there wasn’t more to them. 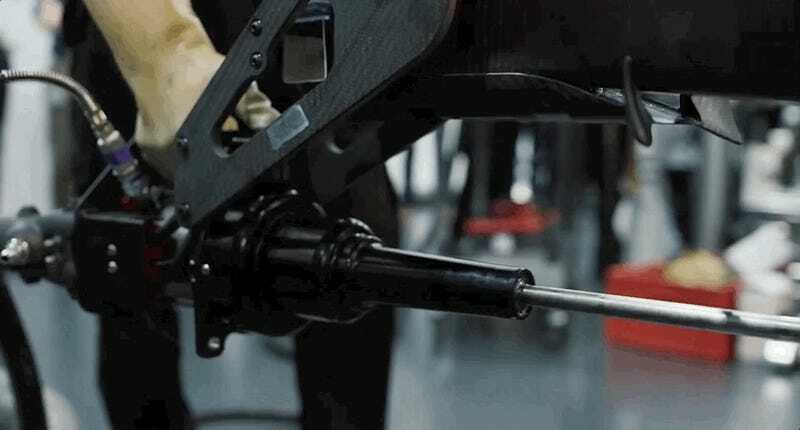 That’s understandable, because F1 is bad about this “car teasers” thing: Instead of casually showing the cars like a normal team would, F1 teams have this weird, self-important procedure in which they tease their cars for the year for two months or more. That’s two months too long. Around the end of one year and start of another, F1 teams start publicizing “car launch dates” for the next season—basically, announcing that they’re going to make an announcement in a couple of months. Then, we start getting teasers like this. Mercedes fires up its engine for 2018, making sure to show nothing of the car because it isn’t time for the debut. The view then turns to Mercedes F1 boss Toto Wolff, whose team has dominated F1 for years, flashing a smile to everyone that seems to say “Oh, wow, I can’t believe we made a race car!” when he’s probably just there because he has to be. Then there’s the Ferrari video, which looks like an animation of the photos I got back when a doctor stuck a camera into my stomach looking for ulcers—all because the team needs to keep the car a secret until its big, important reveal. Here’s a spoiler: The cars likely won’t look that different from last year, they’ll all have halos because that’s a rule now, and, while aerodynamic features will be interesting and different from team to team, we’ll all complain about them anyway because we feel like there’s no passing. Mercedes will probably edge out Ferrari on performance, while Renault has a good race occasionally and Honda begs for one, just one, more chance to get these engines right next time. Just show us the cars, please, F1 teams. There’s no need to tease a storyline we’re familiar with, and surely you learned in school that teasing isn’t very nice.